President Abdel-Fattah El-Sisi’s annual visit to the US to attend the opening of the UN General Assembly session is significant because of the opportunity it presents to explain Cairo’s views on the security and economic challenges facing the world. The occasion is also an opportunity for him to meet with leaders from countries with which Egypt shares mutual interests. As he set off for New York to explain Egypt’s position on the threats it faces at home and abroad the president hoped the world would be capable of understanding the burdens that have fallen on Egypt’s shoulders. He also looked forward to a short meeting with US President Donald Trump as a way to reaffirm their partnership on several crucial issues, most notably the fight against terrorism, restoring stability to the Middle East and the need to address the current impasse between the Palestinians and Israel. In his address to the General Assembly Al-Sisi underscored the importance of the UN as a repository of people’s hopes for peace and development and as a vehicle to facilitate collective responses to natural disasters and epidemics, climate change, war, terrorism, flagrant disparities in the distribution of resources and opportunities for growth. Trump, meanwhile, voiced an opposing view, expressing doubt about the UN’s ability to perform such a role. He appeared to reject the notion that the US had to work together with friends and allies to solve global problems and instead emphasised what he said were his administration’s unilateral successes on the North Korean nuclear arsenal, Iranian attempts to destabilise the Middle East and relaunching the peace process between the Palestinians and Israelis. 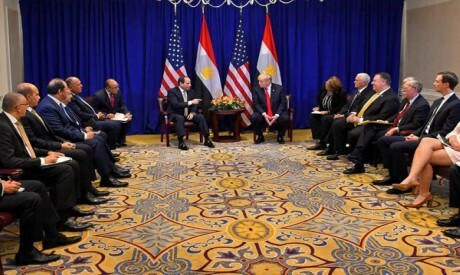 These differences did not prevent Al-Sisi and Trump from complimenting one another on their respective positions, an apparent paradox that attracted the attention of certain quarters of the press. President Al-Sisi is the subject of an ongoing campaign on the part of some newspapers in the US which allege grave human rights violations in Egypt. By welcoming Al-Sisi against that backdrop Trump, too, fell under a cloud. Similarly, Al-Sisi is in an awkward position because of his good relationship with Trump at a time when the US has recognised Jerusalem as the capital of Israel and is moving its embassy there while closing the headquarters of the PA mission in New York. Despite these difficulties the two leaders had the courage to withstand the criticisms and reaffirm their resolve to press ahead with their policies. Trump has vowed to present his “deal” for solving the Palestinian-Israeli conflict by the end of this year and Al-Sisi continued to underscore the importance of a two-state solution which includes East Jerusalem. Neither leader clarified how they might handle their outstanding differences on this question. Al-Sisi also met with Israeli Prime Minister Benjamin Netanyahu in order to underscore Egypt’s central role in efforts to solve the conflict between Israel and the Palestinians. On the Syrian question the two share similar views on how to solve the crisis. In his speech to the General Assembly President Al-Sisi called for the preservation of the Syrian state and stressed that the UN and the Syrian people are the only parties with a mandate to resolve the crisis. Trump stressed the need to end military escalation in Syria and to work towards a political solution that meets the aspirations of the Syrian people. He did not mention the UN in this context, but nor did he insist that Bashar Al-Assad should step down or specify a particular mechanism for attaining peace in Syria. Trump’s implicit belief Qatar is part of the solution in Syria and of the front against terrorism conflicts with the views of Egypt and the three other Arab states that are boycotting Qatar because of Doha’s support for the terrorist Muslim Brotherhood. In his General Assembly speech Trump said his administration’s approach is “yielding great strides and very historic change”. He cited as evidence his trip to Saudi Arabia last year following which the Gulf countries opened a new centre to target terrorist financing. Although there remain discrepancies between Trump and Al-Sisi’s views on some issues there is a clear consensus between the Gulf countries and — indirectly — Egypt, and the White House. This is most evident when it comes to Iran. Trump said: “Iran’s leaders sow chaos, death and destruction. They do not respect their neighbours or borders, or the sovereign rights of nations. Trump is strong on the fight against terrorism and values Egypt’s role. This was confirmed during President Al-Sisi’s visit to the US and his meeting with Trump. Without Washington’s support for Egypt and without Al-Sisi’s determination the anti-terrorism front could suffer. This is why the Trump administration needs, now more than ever, to review Washington’s policy on the Muslim Brotherhood and study the extent to which that organisation promotes violence and terrorism. Egypt, too, should take more time to explain to world public opinion, and to the US public in particular, how the Muslim Brotherhood operates and the role it and its backers, such as Qatar and Turkey, play in exaggerating human rights violations in Egypt, and how their propaganda machines deliberately blur the lines between people arrested on terrorist charges and those who can be considered political detainees. President Al-Sisi also met with evangelical leaders during his trip. Egypt should take advantage of its good relations with a community that supports Trump’s policies to explain to the US public its position on terrorism and the Muslim Brotherhood’s role in fostering violence. It was the second year running that Al-Sisi met with evangelical leaders. In the meeting they praised a number of Cairo’s domestic and foreign policies, especially efforts to halt any escalation between Israel and the Palestinians in Gaza and to promote a lasting settlement to the Palestinian-Israeli conflict. Joel Rosenberg, an evangelical author who lives in Jerusalem and organised the first meeting, said that the leaders praised the Egyptian president for his support of the Christian community in Egypt and for “doing everything possible to improve conditions in Gaza and jump-start the stalled peace process”.